Everyone has a Terrain of Consciousness. You do. Your family members do. So do your friends, your favourite celebrities, your political leaders. Every single person alive has a Terrain. Your Terrain of Consciousness is the fundamental way you see reality. It creates the core operating system that you live from. It is underneath all your programs. It is running you. It creates your thoughts, your beliefs, your values. It drives your choices, your actions and your behavior. It underlies your worldview and your entire paradigm. It is the foundation beneath your entire life. Each Terrain is completely different. Even if you are in the same room as a person at a different Terrain, it is as if you are living in a completely different reality, or in a parallel universe. You each see and experience the world in a completely different way. You only have ONE Terrain of Consciousness. Just like a person cannot simultaneously wear two pairs of glasses, you only see the world through the lens of one Terrain of Consciousness. And just like a person cannot simultaneously be in France and Australia, you can only operate from one Terrain of Consciousness. Your Terrain can change as you grow and evolve. As your awareness expands throughout your life, you may shift to a new Terrain. Such a shift is monumental, for it changes everything in your life: the way you see the world, the choices you make, the people you are drawn to, the work you do, your very relationship to reality. Some people's whole world falls apart when they jump Terrains. Nothing seems to fit them anymore - not their work, their friends, their life... It's huge! Every culture and civilization also has a Terrain of Consciousness. This is known as the 'Prevailing Terrain' of the day. It shapes life in that civilization - at a social, economic, political and cultural level. 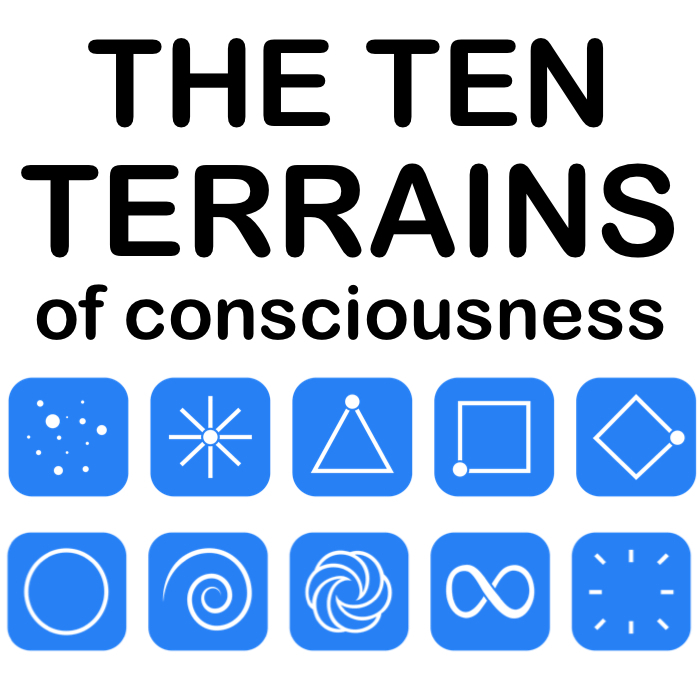 The ten Terrains exist upon a Continuum. It is a Continuum of 'awareness' moving from separation to Unity. As a person moves along the Continuum, their perception slowly expands by degree from outer to inner, from victimhood to Self Responsibility, from disempowerment to Empowerment, from ego to Service, from isolation to I AM, from illusion to Truth, from control to Surrender, and ultimately, from fear to Love. The Continuum is NOT like ten steps on a ladder. The Continuum is more like a series of concentric rings, each with a more expanded perception of reality than the one inside it. We orbit each ring, going round and round, as we play and explore at that Terrain and learn its lessons. Then, when we are ready, we jump to the next ring for our next play session! Everyone's journey through the Continuum is unique. Your journey through the Continuum of Terrains will start and finish at a different place than everyone else's journey and will unfold at a different pace. Indeed, your journey through the Continuum will be different in each lifetime. In one lifetime, you might stay at the same Terrain for your entire life, as someone who is here to 'hold the collective Field stable'; in another lifetime you might expand through many Terrains, as someone who is here to 'shift the Field'. It all depends on what you are here to learn and explore and your unique role in our collective evolution. The Continuum of Terrains is humanity's spiritual journey of evolution. It is the ever expanding journey from 'separation' to 'faith in a higher power' to 'free will' to 'selfless duty' to 'unique expression' to 'heart connection' to 'inner truth' to 'universal truth' to 'Oneness' and ultimately to 'Being'. This is the journey that every single person and civilization on this planet is moving through, at their own speed and in their own time. Just like a hand healing itself from a cut, Consciousness is a self-healing system, healing itself back to Unity. ​The Terrains are not levels or grades. They are﻿ ten perceptual filters on the ONE Infinite Consciousness. ​Your Terrain is not WHO you are, it is WHERE you are. A person is not 'a' Diamond, they are 'AT' Diamond. This is the stage they are currently at in their evolutionary spiritual journey. ​No one Terrain is better than any other. Just like it is no better to be 14 years old than 13 years old, it is no better to be at one Terrain than at another. All Terrains are of equal value. Each Terrain brings with it important gifts, lessons & challenges. Each Terrain is like a fun playground with its own rides and games to explore and enjoy. Where you are on the Continuum right now is exactly where you are meant to be in order for you to give the gifts you are here to give now. There is no goal to shift to the next Terrain. It is not a race. No one is 'ahead' of you or 'behind' you. You cannot rush your journey through the Continuum. You cannot use your mind or willpower to jump to a more expanded Terrain. You will only shift Terrain when your Infinite Self is ready for you to do so, once you have learned the lessons of your current Terrain. So enjoy the ride! Knowing your Terrain will change your life! It will help you to know yourself better, understand where you are at on your own evolutionary spiritual journey, get along better with other people, make the right choices for YOU right now, and have much greater peace of mind about the state of our world.